While many western observers might consider Russia’s authoritarian political system repressive, when it comes to public spaces the people in the capital city of Moscow are experiencing a new kind of freedom. In Moscow, Soviet-era drab and tacky are out. Classy building facades, urban greenery, bike-sharing and pedestrian-only streets are in. And Canadian architect Michael Geller says it's stunning to see how fast the transformation has happened. 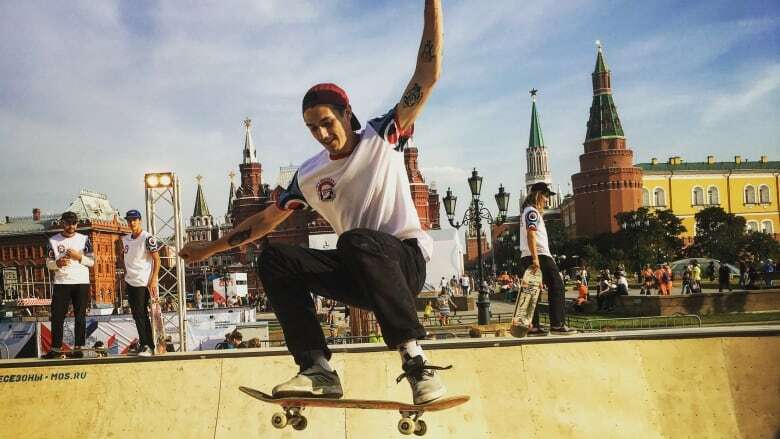 "They [visitors] expect it to be grey, dirty and full of graffiti, but it's none of that," Geller says admiringly, as he sips a craft beer at a patio in Kuznetsky Most, a coffee shop- and eatery-filled neighbourhood just a few blocks from the Kremlin. 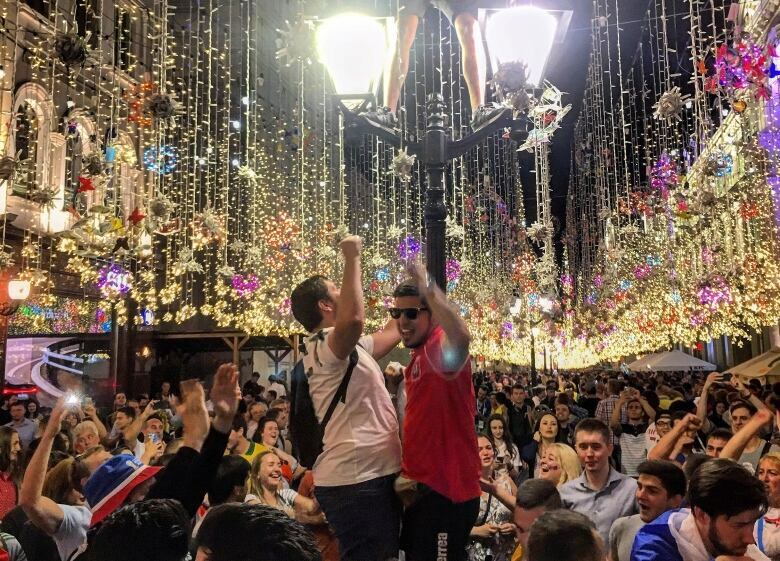 While many western observers would consider Russia's authoritarian political system repressive, when it comes to public spaces the people in the capital are experiencing a new kind of freedom. It's a sort of urbanism in overdrive. "I am impressed in the last two years," Geller says of the new, polished feel of the downtown. 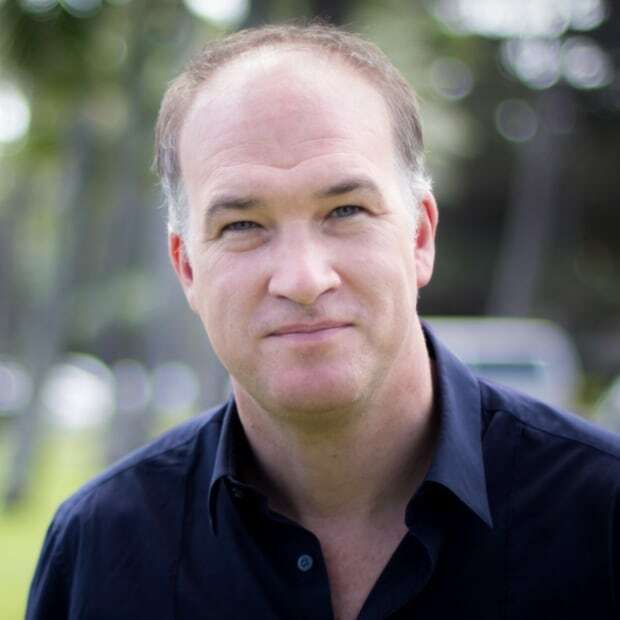 "There is no doubt a lot of money has been spent. It's fabulous." A frequent guest lecturer and judge for Russian architectural competitions, Strelka — one of Moscow's top urban design firms — has invited Geller to the city seven times in recent years to share Canada's best practices with young Russian designers. Strelka has led many of the most prominent redevelopments in Moscow, including building facelifts, street redesigns and the creation of new green spaces. In fact, Geller says he's increasingly bringing home as many good ideas to improve Canadian cities as he's leaving behind for the Russians. "We talk about pedestrians being important, but we don't have streets like this [in Vancouver]," says Geller, of the recently tiled promenades that are now ubiquitous around the city's downtown. "They encourage people to walk. They discourage automobiles." The number of urban renovation projects undertaken in Russia's capital since 2015 is dizzying. Thousands of unlicensed vending stalls were swept away, eliminating serious eyesores. Major streets, such as Moscow's Garden Ring Road, were narrowed and sidewalks widened with more than half a million new paving stones. Thousands of kilometres of piping and electrical wires were buried underground. The facades of 12,000 buildings were given a facelift. That's on top of the addition of hundreds of new parks, cultural landmarks and other monuments. While some of the projects were directly related to the World Cup of soccer this past summer, the overall scope of the effort is far larger. Estimates from Russian media sources (RBC) put the price tag at a stratospheric $1.6 billion US spent since 2015. The total outlay is expected to reach $3.5 billion by 2020. Almost all of that spending has focused on the area around Moscow's core. To put that in perspective, the Moscow Times reported that the capital now accounts for a third of all municipal spending in Russia, with the remainder of the budget having to be shared between 40 other cities. It's unheard of for any European or North American city to spend so much in such a short period of time on urban renewal. "It's a distinct policy now of the Russian state leadership and the Moscow leadership to ... harness the potential of urban improvement and architecture to create a sense of wellbeing," says Michal Murawski, a British scholar with the University College of London's School of Slavonic and Eastern European Studies. Murawski has spent the past year in Moscow analyzing the social and political implications of the city's facelift. "Urbanism is a stated priority of Putin's fourth term in power," he says. Murawski adds that there's a long history of autocratic regimes beautifying cities as a way to glorify leaders. 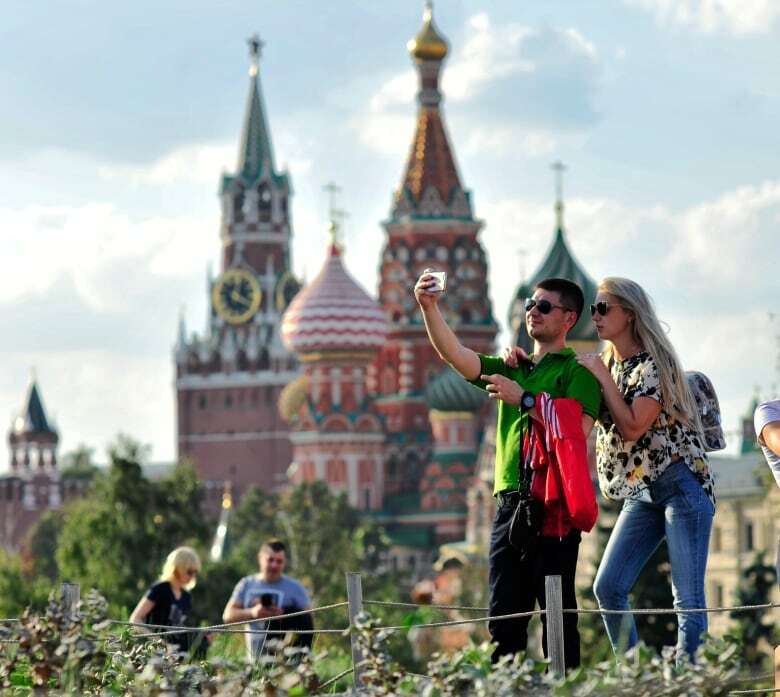 And by trying to make Moscow an urban showpiece, the Kremlin has made a political calculation. "It's designed to create support for the regime," he says. In 2011, the Kremlin was shaken by street demonstrations that drew over 100,000 people, protesting declining living standards. Murawski says keeping people in the capital happy by creating better urban spaces is part of the strategy to insulate Putin if times get tough again. Putin made reference to the improvements as he praised Moscow's recently re-elected mayor Sergei Sobyanin, in a speech in September. "The atmosphere of the city has changed," said the President. 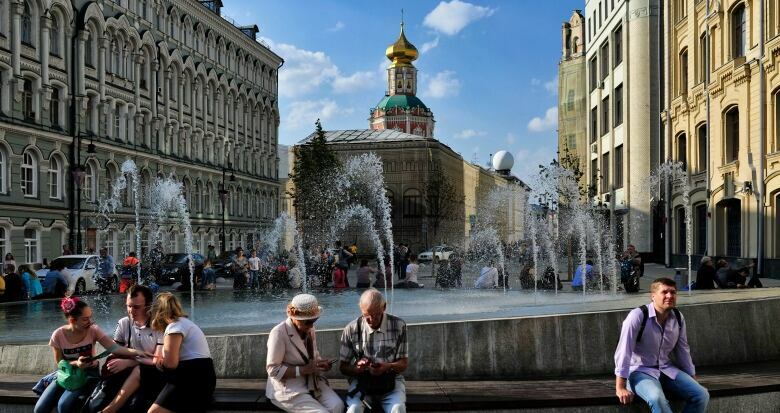 "Moscow, with its rapid rhythm of life has become ... hospitable and cozy." The crown jewel in Moscow's urbanist redevelopment is Zaryadye Park, an oasis of nature and culture just a stone's throw from the Kremlin. "It's extraordinary that the decision-makers were convinced that instead of squeezing profit of out of this piece of land — surely the most expensive piece of real estate in Moscow, if not Europe — that it should be a park," says Murawski. Zaryadye contains an enormous amphitheatre, a media centre and grounds that feature examples of Russian geography, from the Arctic to the desert. Its most stunning architectural feature is a platform extending out into the Moscow river that offers spectacular views of some of the city's best-known landmarks, including St. Basil's Cathedral and the buildings of the Kremlin. No official price tag has ever been attached to Zaryadye, but Russian media outlets have published estimates ranging from $250 million US to $500 million. "It's what a new stadium costs," Murawski says. And he says Putin has tied himself personally to the project. "I think on the project website the wording was, 'with this single gesture of Putin, the golden land was given back to the city and its inhabitants.' So it's this grandiose gesture of gifting which ties this park inherently to politics." Indeed, around Moscow some refer to Zaryadye as "Putin's Paradise." 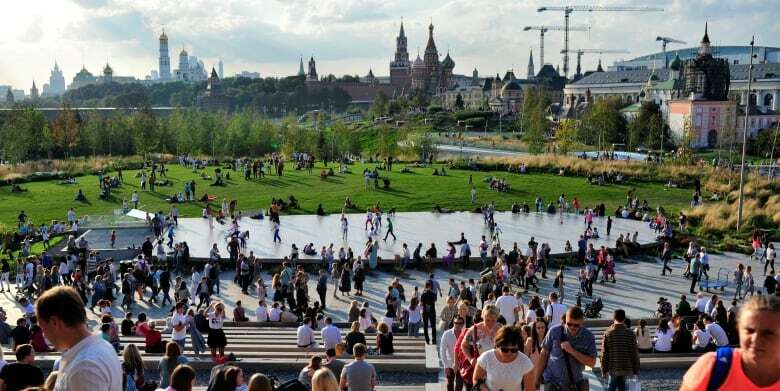 The park has only been open for a year and many of the renovation projects in the city's core were completed just in time for this summer's World Cup, so many Russians are only now beginning to appreciate the scope of the changes. At a recent street festival thrown in celebration of Moscow's 871st birthday, the pride many people felt in their capital's new look was evident. "The city has changed dramatically for the better," says senior Vladimir Zubkov, as he lounged with his wife Lyudmila on a lawn chair in a temporary garden on the usually busy Tverskaya Street, which was closed and transformed into a park for the day. "The mayor [Sergei] Sobyanin has done a lot to lessen the traffic in Moscow. He made new roads. He cleaned up Moscow. Moscow has been transformed." "Moscow is the best city in the world," Lyudmila adds. "The most important thing is that our historic streets have been restored," says Anton Kirilov, another Moscow resident. "Look how amazing they are. People here feel themselves and worthy and valuable and happy to be living in this country." Recently, Murawski the anthropologist hosted an academic conference in Moscow — nicknamed "Zaryadyology" — that dug deeper into the themes behind Zaryadye and Moscow's urban renewal. He says a key question for many academics is whether greater urban freedom and a sense of wellbeing will inevitably lead to a demand for greater political freedoms. "It's too early to judge that. It's much too early to see if Zarayde and Maya Ulitsa creates a kind of democracy and freedom through architecture," Murawski says. "The only thing we have to go on is that people take more selfies [at the park] than they used to. And that people voted in increased numbers for Putin." Michael Geller, the Canadian architect, says whatever political motivations have driven Moscow's urban renewal, they are secondary to how much more livable they have made the city. "In the end, I think it's more important not to judge how something may have happened," he says. "We have projects across Canada and the inspiration was questionable, but they became very livable places."